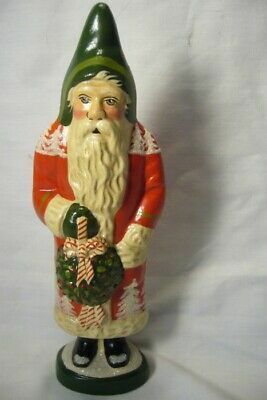 Vaillancourt Folk Art Red Forest Santa with Kissing Ball signed by Judi! Another Christmas Keepsake Designed by Judi Vaillancourt and Hand Painted by the Vaillancourt Artists. Made in the USA since 1984 This Piece is Part of the 35th Anniversary Items. Vaillancourt Folk Art 2014 Starlight Santa on Scooter Personally Signed by Judi!